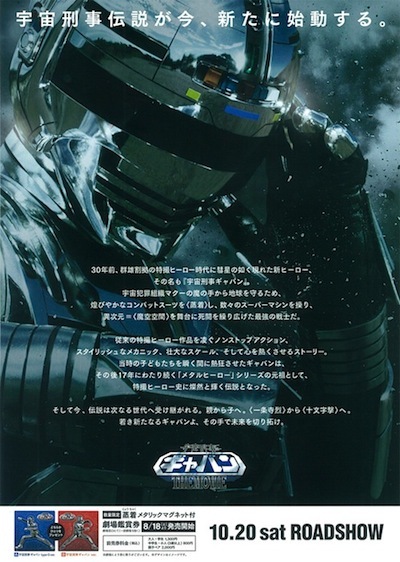 As I reported in my August 14th update, SPACE SHERIFF GAVAN: THE MOVIE: There’s a New Sheriff in Town on October 20th, hot on the heels of the success of GOKAIGER VS. GAVAN, which opened this past January, Toei is producing a follow-up feature film to celebrate the 30th Anniversary of the “Space Sheriff” series: GAVAN, SHARIVAN, and SHAIDER (which became popular throughout the world, and are still beloved today). This is the first full-length trailer, featuring a decidedly more straight-jawed style, compared to those of the current — and more light-hearted — Super Sentai and Kamen Rider films and television shows. The trailer also reveals the characters, villains, and the return of Gavan’s compatriots, Sharivan and Shaider (now played by younger actors). The Osamu Kaneda-directed film will open in Japanese cinemas on October 20th.